Jin Akanishi has started his Mi Amor tour, and in about two weeks time he will be in Tokyo - the Tokyo concerts are 27-28 November and 1-2 December. Last week he played Sapporo, and one of his fans posted a picture of boxes outside the venue where presents, fan mail etc could be placed. (This is a regular feature in a lot of non-JE concerts). The idea of an International Postcard Project was born! The basic idea is to send Jin a message via a postcard. The message can be anything you like: congratulations on his tour, new mini album, independent artist status, letting him know you support him, letting him know you support him, hoping has a concert in your country etc etc. I am going to the Tokyo concert, so I can collect the post cards, and carry them to the venue, and place them in the present box. So JIPs - anyone want to send a postcard to Jin? 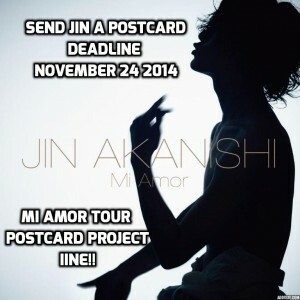 *Deadline - please mail the postcard in the next week (7 days), ie by November 24. I would like to place the postcards in the box at the first Tokyo concert. * Where to send them? Please send me a DM either lj or via twitter, and I will send you my postal address. * But then it will have your address on it! Yes it will, and I intend to cover my address with some of the many panda, gold star, red hearts and other sparkly stickers I own thanks to the magic of Loft, Daiso and Tokyu Hands. The main focus of the postcard is your message to Jin. *Why a postcard? Postcards are quick to write, cheap and easy to mail, and easy for me to receive and transport to the concert. *How many postcards can I send? As many as you like! *What type of postcard? Any type is ok - something hand made, fan art, something showing a famous recognisable place near your town or country-anything you like! *What kind of message? Let's keep it supportive, happy and positive, shall we? Please play nice. *Can I send a letter rather than a postcard? Yes you can, but personally I would prefer you send a postcard (see above), but if you want to send a letter, please make sure there are two envelopes - one with the letter to Jin, placed inside a bigger one addressed to me. That way I can remove the outer envelope. *When is the deadline? The deadline is fairly soon - a week from today. If possible I would like to put the postcards in the box on the first concert date. If some postcards come later I can try to put them in the box before the last concert on 2 December. If postcards arrive after that, I will email JIPs staff and ask if there is an address I could send them to as fan mail. *What's your address? Please PM me via this lj (bellemainec) or via DM on twitter @/bellemainec or @/bellectweets. I don't want to put my address online obviously. *I can't write the address in Japanese. That's ok, you can write the address in romaji! Japan Post can deliver it. What kind of postage? Most post cards are sent via air mail anyway but if you can choose, please choose air mail. *I have a question? Please PM me, or comment here and I shall try to answer it. Sent u a PM in ur inbox abt getting ur mailing address from u.